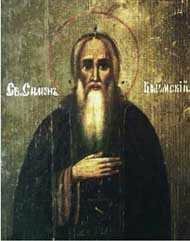 The MonkMartyr Simon of Volomsk, in the world Simeon, son of the peasant Mikhail from the vicinity of Volokolamsk, was born in the year 1586. At 24 years of age, after long pilgrimage through Orthodox monasteries, he took monastic vows at the Pinegsk Makar'ev monastery, and in the year 1613 he settled 80 versts to the southwest of Ustiug at the River Kichmenga, in the Volomsk forest. Here he spent five years alone, remote from people; he nourished himself with vegetables which he himself cultivated, and sometimes indeed asked for bread in some settlement. When lovers of the quiet life began to gather to him, the Monk Simon, through a grant of tsar Mikhail Feodorovich and with the blessing of the Rostov metropolitan Varlaam, erected a temple in honour of the Cross of the Lord, and in 1620 was made head of the monastery founded by him. A strict ascetic, serving as an example to all in virtue, love of toil, fasting and prayer, he was wickedly murdered in his own monastery on 12 July 1641. The body of the Monk Simon with reverence was buried on the left side of the church built by him. Veneration of the monk began in 1646 after gracious manifestations witnessed to of his relics. His life was compiled in the XVII Century.